Empathy with end users and a deep concern for their well being- inculcated in every single Harsoria employee. Discipline and an uncompromising adherence to strict tolerances at every stage of quality control. Standardization in all products through an automated and tightly controlled environment. 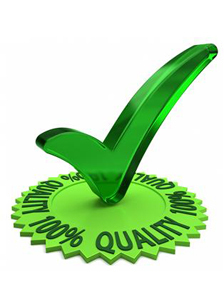 Harsoria facilities are maintained in strict compliance with international quality standards. All products are moulded in a controlled environment and assembled in a Class 10,000 clean room. Finished products follow a regimen of physical, biological and chemical tests before they are allowed to be depatched to the consumer. In continuation with the objective of providing world class products, Harsoria facilities have been audited and certified for compliance with ISO 9001:2008 certification. The certification has been done by DNV Quality Assurance, Norway. Medical Devices produced by Harsoria have been certified for meeting the requirements of Directive 2007/47/EEC Annexure II (excluding Section 4), by DNV Quality Assurance, Norway.